Eight Marine Corps F4F-4 Wildcats lifted off of Fighter One, a coral strip southeast of Henderson Field on Guadalcanal, on the morning of 12 November 1942. Led by Maine Captain Joe Foss, who had scrambled his flight minutes earlier in response to intelligence that a Japanese force had taken off beyond Bougainville, the stubby little Grumman fighters climbed out to level off at 29,000 feet. After orbiting for 45 minutes, Foss spotted a formation of 31 Betty bombers over the east point of Florida Island, at least 20,000 feet below. "Let's go gang", Foss called to his flight as he did a wingover and pushed into a full-throttle dive. Coming down almost vertically above the bombers at over 500 miles per hour, Foss opened up. As he flashed past, he could see smoke streaming from the bomber's engines. With a gut-wrenching pull-up, he climbed above the formation and repeated the diving attack, knocking down his second Betty of the day. 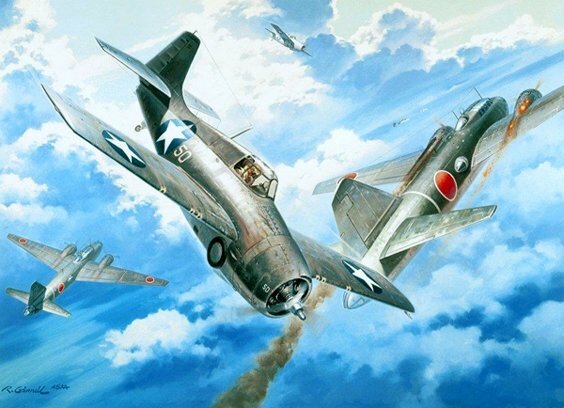 A few minutes later, Captain Foss encountered a Mitsubishi Zero, which he shot down for his 22nd victory in 30 days of combat. Number 20 for Joe" is hand signed by the legendary Wildcat Ace Joe Foss, VMF-121, and artist Roy Grinnell. The image depicts Capt. Foss's 20th and 21st victories near Guadacanal, November 12, 1942. He finished the war with 26 victories and was the recipient of the Medal of Honor.